Pet Rock place-card holders also double as party favors. Trail mix in vintage tupperware makes a fun party favor. Emily's Cheese and Onion Toast appetizers. Katie's Spicy Bluecheese Celery Boat appetizers. First course: cheese and white wine fondue. Second course: broth fondue with beef. Katie made Chocolate Covered Pretzels for the Caramel Fondue. Emily made Pound Cake for the Caramel Fondue. There is nothing better than a theme party to bring the kid out of you and your friends. Starting with a theme gives you some creative direction when planning your party. My most recent party was all about FONDUE! The fondue theme branched out into a full on seventies theme that included everything from Pet Rocks to Amaretto Sours (homemade of course). My good friend Emily and I came up with retro hors d'oevres and dressed in our best attempt at 70s attire. 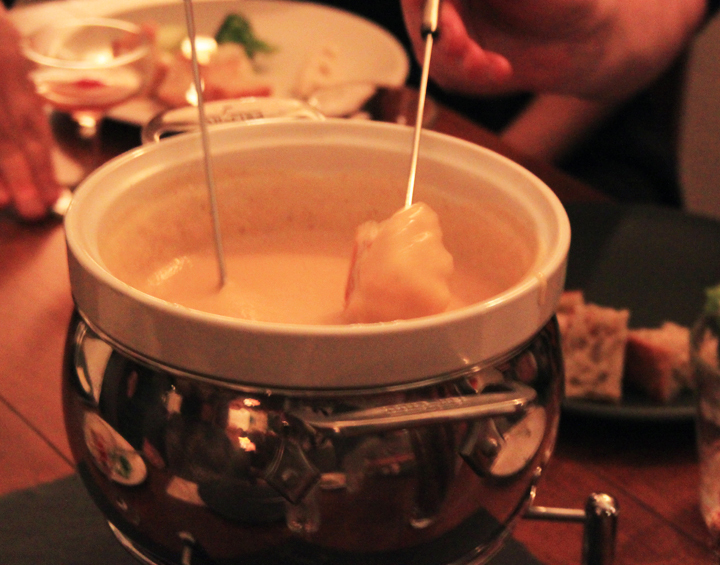 Fondue became the means for facilitating each of our three dinner courses: cheese, broth, and a caramel dessert. And at the end of the night we sent our friends on their way with some delicious trail mix. I even found vintage tupperware online that we used to package the gift. What better way to hit the trails than with trail mix?! You can view the Caramel Fondue recipe here, the Beef Broth Recipe here and the Cheese Fondue recipe here. You can also see the recipe for the Trail Mix here, the Amaretto Sour here and the Pound Cake here. To check out the appetizer recipes for the Celery Boats go here and for the Cheese and Onion Toasts go here. Plus, a little more about Pet Rocks can be found here. Hope this inspires you to try a Seventies Fondue party of your own! Our friends really enjoyed this one.